To modern readers, this can sound rather shocking as for us, going to the toilet is most definitely a private matter. However, public latrines were perfectly acceptable in Ancient Rome. Toilets are to be found at many archaeological sites. They vary in sizes and shapes from the large semi-circular or rectangular ones to the smaller private ones with up to 10 seats. Here is a collection of public toilets (foricae) I have photographed at different sites. The latrines near the Forum Baths at Ostia Antica (Italy). The latrines near the Forum Baths at Ostia Antica (Italy). The stone seating is still preserved around the walls, and there is a small basin next to the pillar which separates the two doorways into the room. The latrine along Frontinus Street (colonnaded street), built in the end of the 1st century AD at Hieropolis (Turkey). The room is divided longitudinally by a row of columns that supported a roof composed of travertine blocks. The latrines of the gymnasium of Salamis (Cyprus), a semicircular structure with a roof supported by columns. It had a capacity of 44. The latrines of the Great Baths complex at Ancient Dion (Greece). The rectangular latrines of the gymnasium at Metropolis in Ionia (Turkey). The latrines for 12-14 people in the House of Theseus at Paphos (Cyprus) decorated with a geometric mosaic. The latrines in the Baths of the Laberii at Uthina (Tunisia). The public latrines with open courtyard paved and a mosaic floor at Scythopolis (Israel). The latrines of the palaestra at Philippi (Greece). The latrines, located in the Imperial forum of Minturnae (Minturno, Italy). The partly restored public latrines at Magnesia ad Maeandrum (Turkey). The latrines, intended to serve the public that frequented the Roman Agora in Athens. It was a rectangular hall with seats on 4 sides. It was roofed except for the centre area which was open for ventilation, 1st century AD. The public latrines at Caesarea (Israel) dating to the Byzantine period. The latrines at Ephesus (Turkey). They were part of the Scholastica Baths and built in the 1st century AD. The latrines at Ephesus were the public toilets of the city. The latrines of the gymnasium at Tralles (Turkey). They are one of the largest Roman latrines in Turkey with a capacity of 65 people. Multi-seat latrines in the Hospitalia of Hadrian’s Villa. They were designed for people of differing social class (the Emperor and his guests had single-seaters). Reconstruction drawing of a public latrine at Forum Hadriani (Germania Inferior). Some latrines were adorned with marble revetments and fountains like the latrines of the Wrestlers Baths at Saint-Romain-en-Gal (France). The walls were decorated with frescoes depicting wrestlers and discus-throwers under the supervision of a referee. The latrines of the Baths of the Wrestlers at Saint-Romain-En-Gal (France). They were luxurious public toilets adorned with fresco representing wrestlers and a referee. Private toilets have been found in Roman houses and upstairs apartments. 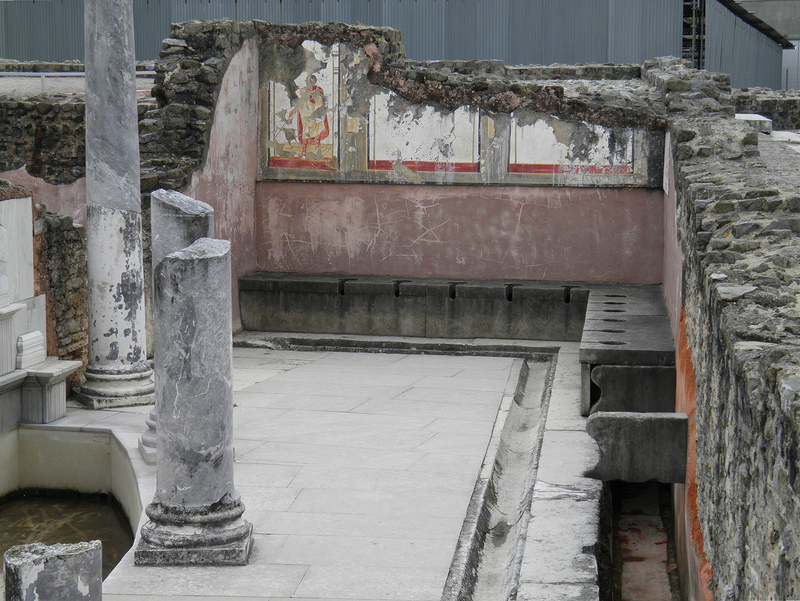 Pompeii and Herculaneum have good examples of these (see Image Gallery: Pompeii’s Toilets). 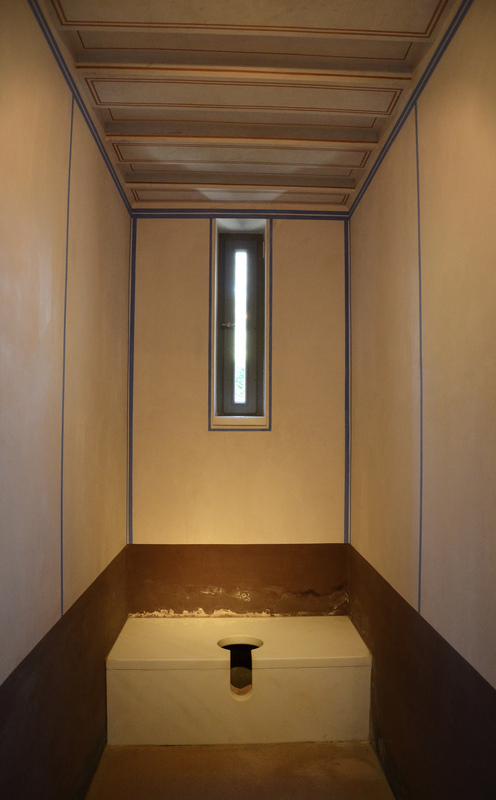 Reconstruction of a single latrine next to the culina (kitchen) at the Pompejanum (Germany), an idealized replica of a Roman villa. However, if you were not fortunate enough to live in a house with a toilet, you would use a chamber pot. Communal latrines were also present in the camps set up by the Roman armies, particularly on the frontiers of the Roman Empire. Some of the best representations of soldier’s toilets are to be found around Hadrian’s Wall in Britain. The Latrines at Housesteads Roman Fort (Vercovicium) in Great Britain. There were wooden seats along the sides, set over a deep channel. A smaller channel in the centre of the building was used for washing sponges. Reconstruction drawing showing the communal latrines in use, Housesteads Roman Fort (Vercovicium). Water tank in Housesteads Fort. It was lead lined to hold water for the latrine. The Hospital latrine at Segedunum Fort along Hadrian’s Wall. The Latrine building at Vindolanda Fort along Hadrian’s Wall. These latrines could have accommodated up to 16 soldiers at a time, seated on timber benches above the sewer channels. Further photos of Roman latrines can be viewed from my image collection on Flickr. This post was updated on 19-11-2015 and on 19-11-2016 for #worldtoiletday to include new images. Thank you, I corrected it! I have just returned for Algeria and Tunisia. Fabulous Roman potties at several sites. Five at Timgad alone. I just visited the Roman latrines next to the 2nd century theater in Beit She’an, Israel. The ‘seats’ are marble slabs jutting out from the walls with a channel of running water below. soap in the vinegar and water.